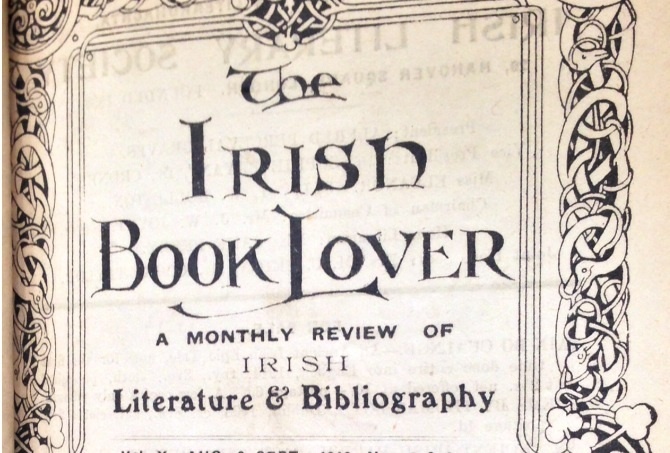 For all of my librarian and library-loving friends… The following is recorded in The Irish Book Lover in 1918. The Society visited the Public Library, Lower Kevin Street, Dublin, on Saturday, the 22nd June, 1918, and were heartily welcomed by Mr. J. P. Whelan, the librarian; who showed them a number of rare works at present in the Library, including a volume of Malton’s views of Dublin, old catalogues, rare pamphlets, manuscripts, maps, etc. Mr. Dix, the Chairman of the Society, warmly thanked Mr. Whelan for the very kind reception he had given them at their visit, and pointed out what valuable material the Library contained for Students of Irish History, Antiquities, etc, and stated that Mr. Whelan had for years welcomed additions to the Library of that kind, had carefully preserved them, and fully appreciated the value of even the smallest pamphlet dealing with Dublin or Irish subjects generally. In commemoration of the visit he presented an old map of Ireland, and said he hoped the members of the Society would, from time to time, visit this Library and make use of its resources, and added that he was sure that Mr. Whelan would welcome gifts to the Library. Mr Whelan suitably replied, acknowledging with pleasure what had been said, and gave some particulars of the foundation and development of the Library, which now contains some 10,000 volumes, but owing to limited resources at present available to the Corporation for the purpose; and the necessary expense of upkeep of five Municipal Libraries and Art Galleries in Harcourt Street, further progress was at present slow. He hoped that the Members would come again to visit the Library, where they would be always welcome. He then took Members of the Deputation around the Library, pointing out the classes of books and stated that the system of classification followed what was known as the “Dewey” system. The Irish Book Lover is available to read in the National Library of Ireland and Trinity College Library Early Books collection. I’ll be revisiting Kevin Street Library, currently undergoing extensive restoration, soon.